Last week was National School Lunch Week (October 9-13). 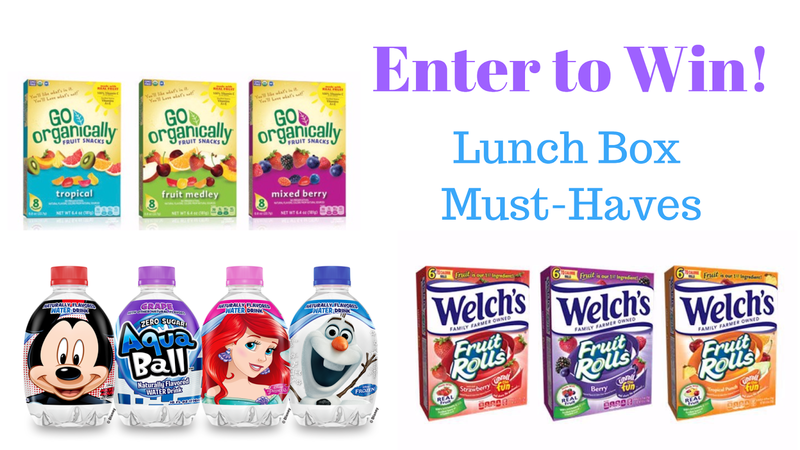 To celebrate, I've compiled a quick list of must have lunch box items that both children and parents will love, plus, you can enter to win a prize pack featuring some of these great brands for your little scholar's school lunch box. This post and giveaway has been sponsored by the brands listed below. My children love Aquaball water beverages. Not only do they come in great flavors like fruit punch, grape, strawberry lemonade, and berry, but they are naturally flavored and have zero sugar. Children will also love seeing their favorite Disney and Marvel characters on the bottles. We purchase cases of Aquaball all the time for playdates, kid parties, and even Easter baskets. It's a refreshing beverage with flavors your children will enjoy, and you can feel refreshed that your children are staying hydrated without all the artificial flavoring, colors, or high sugar drinks. Not only are these the perfect size for lunch boxes, but they are also great for small coolers to take to sports games. Welch's recently came out with fruit rolls. They are strips of rolled fruit and are loved by my children. They currently come in strawberry, berry, and tropical punch flavors. The tropical punch is my personal favorite, but they are all delicious. Each flavor is made with real fruit, natural colors and flavors, and are gluten free. They also happen to be a great source of vitamins C, A, and E. They have a natural sweetness to them, and fun to eat. Speaking of snacks with a natural sweetness, Go Organically Fruit Snacks are 100% organic and made with real fruit. Go Organicaly Fruit Snacks come in fruit medley, mixed berry, and my personal favorite: tropical. My children love fruit snacks, and we have tried a variety of them through the years. Typically I hate fruit snacks and think they are gross, but these ones I love myself, so if I like them, I have no problem giving them to my children. Go Organically is also gluten free, and a good source of Vitamin C with no preservatives. Popcorn has always been a healthier alternative to greasy, sodium drenched potato chips. The Little Kernel Mini Popcorn is not only healthy and delicious, it's adorable! These bags of mini popcorn come in flavors like white cheddar, truffle sea salt, pink Himalayan salt, sweet and salty, naked, and butter. Popped in 100% olive oil, these tiny snacks are going to be a huge hit with the kiddos. Want to win a few of these products for your kiddos? *Disclosure: This product was received as a sample in exchange for an honest, unbiased, review. The reviews and or opinions on this blog are 100% my own. No monetary compensation was received and I was not required to write a positive review. I am disclosing this in accordance with the Federal Trade Commissions 16 CFR Part 255: Guides Concerning the Use of Endorsement and Testimonials in Advertising.